It’s the little things that count in Timothy Near’s production of “Mrs. Warren’s Profession.” And the devil is truly in the details. Before the play ever begins, a dumb show has the two protagonists – a Victorian-era mother and daughter – being dressed by chambermaids. 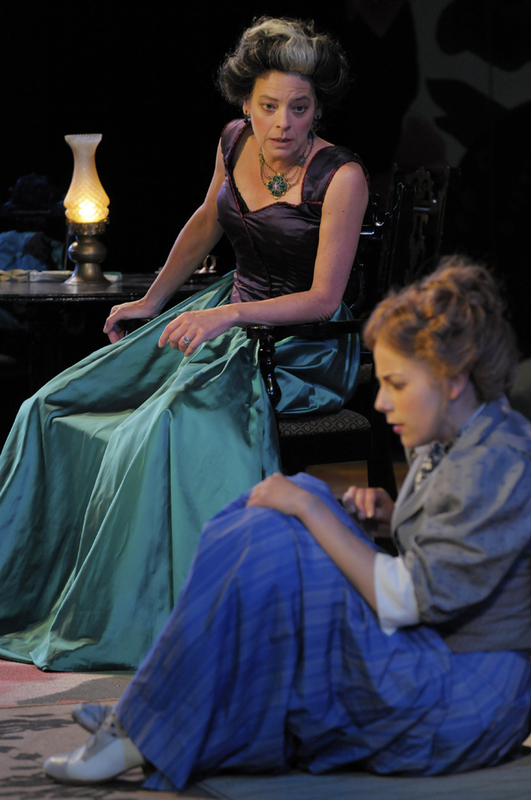 The mother (Stacy Ross) is laced into a tight corset and then bustled and pouffed into an elegant ensemble. The daughter, Vivie (Anna Bullard), in contrast, strips down to her underwear and has the maids take her corset off before re-dressing her in a loose-fitting skirt and blouse. It gives us a somewhat sardonic (and when was George Bernard Shaw ever less than sardonic?) preview of what will subsequently unfold. More details: those maids, who also double as stagehands for all the scene changes, are dressed in gray, with aprons and mob caps (costumes by Meg Neville), rather as any poor British working girl of the time would be. They are silent, efficient drab, never acknowledged by any of the actors they serve. A stunning image ends the final curtain call as the maids slide an iron grate shut behind the exiting principals and stand, sullenly staring out at us, as if they were imprisoned in a cage. And again, that is what the play is about. Don’t let the name fool you. Director Near is a woman and she adds extra punch to Shaw’s feminist diatribe. Mrs. Warren (Ross) is, of course, in the world’s oldest profession. Now a madam, with prospering houses in Vienna, Brussels, Budapest and beyond, she has come home to England, in company with her business partner (and occasional lover), the crude and obnoxious Sir George Crofts (the always-delightful Andy Murray) to check up on her seldom-seen child. But Vivie is all grown up and a clever, educated “new woman,” thanks to the benefits of her mother’s wealth. She wants more than money from the woman who is virtually a stranger to her. She wants answers to questions like who is her father and why has her mother been absent for so long. And answers are the last thing Mrs. Warren is eager to supply. She has given her daughter “plenty of money to make things go smoothly” and that should be enough. Vivie now has the chance at respectability that her mother, squeezed by the system into a disreputable career, never had. Trouble is, the girl doesn’t really want it – except on her own terms. In Shaw’s England, according to the program notes, a prostitute could make 25 pounds sterling a night, while a skilled worker earned some 62 pounds a year. A girl born into poverty, as Kitty Warren was, had few choices available to her. She could go to work in the local lead factory and die young, as one of her sisters did. She could, if she was lucky, marry and lead a life of household drudgery, like another sister. Or, trading on her good looks, she could go into business for herself. Having chosen the latter, she stands by her decision with one reservation: “It’s only good manners to be ashamed of it.” But, when she finally tells Vivie the story of her life, her daughter is overcome with admiration. For a brief time, the Warren women are happily reconciled. But it doesn’t last long. The play was written in 1893, one of the earliest in the Shaw canon. Although it has numerous instances of his famous wit, it never was intended to be a “pleasant” play. Much of the humor is supplied by secondary characters (i.e., the men): Murray’s Croft, Dan Hiatt’s good-natured, well-meaning family friend, Richard Thieriot as Vivie’s would-be lover and Rod Gnapp as his father – a church cleric with a past. They each perform well, but this is a woman’s play and the women, especially Bullard, steal every scene. And, given the climate in which the play is set, it’s about time.